Join The Gossip: Yummy in My Tummy! Don't know what my deal is right now but I am craving dessert - any, all, send it my way and I won't turn it down...well, unless it had nuts in it because I hate nuts. Anyways, "feast" your eyes on these bad boys! Chocolate Chip Cookie Dough Cheesecake Bars are def my fav dessert, next to princess brownies. Have you ever had them? They are amazing! Here's the recipe in case you're interested. I'm obviously pinning desserts today, what are you pinning? 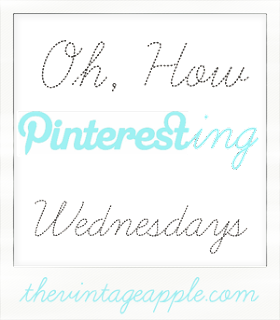 Link up with Michelle of The Vintage Apple for Oh, How Pinteresting Wednesday and share your photos of the week. Here's my board containing these photos. To see all of my pinned photos, add me! And now for another great blog hop - What the Hell Wednesday hosted by Christianna of The Girl With The Blue Bow! So here's my issue this week: nightmares. Last night I kept having nightmare after nightmare (and I never remember my dreams) about my birthday. My parents knew it was my birthday but just didn't care. The wouldn't wish me a happy birthday or even pay attention to me. OK that may not be a real nightmare, but I did wake up with a "What the Hell?" feeling! I have a sweet tooth, too! thank god i'm eating right now - otherwise i'd be in trouble with this post! All of those desserts look so yummy! I think I need to go bake some brownies now! I have a major sweet tooth too! Love the coffee and donuts especially. How cute and clever! Oh wow these look so amazing! I am trying to curb my intense sweet tooth...and this post didn't help!! Ok, so I think I might just have to make those chocolate chip cookie dough cheesecake bars. Like that's the best of every world! And I had nightmares too. I hate the kind that you had, where you know it doesn't make sense and they just kinda piss you off and make you say "what the hell"? these all look SO GOOD! and so much more tasty than the salad i am munching on right now! omg that crumb crust on that first cupcake looks insane!! In deed all your pins look so yummy! I have a big sweet tooth!! Thank you for the inspiration. YUM! I love smores! :) Those look awfully tempting! Oh gosh this is like heaven! I want to eat them ALL! I'm totally going to try that chocolate chip cookie dough cheesecake recipe. That's like 3 desserts in one! what's "pinning"? is that some internet thing that i don't know about. I love desserts. Cheesecake cookie dough bars sound yummy!. I ate (and I'm not kidding you) at least 5 cupcakes over the weekend. Major sweet tooth here too. mmmm!!! send them my way too! yes please and thank you! I'm salivating over here! I have such a sweet tooth all the time! Mmm... they all look delish! I've actually made the choc. chip cookie dough cheesecake bars and they are AMAZING! SOOO GOOD! Oh my, everything looks so yummy! I know its summer but that cup of hot chocolate looks really good, hah! Oh my, those look so yum! Those s'mores and chocolate chip cookie dough bars look divine! Is it bad that I would eat one at 7AM? Um, yum. My mouth is watering over here. Must. Have. Sweets.